Beau Allen blocks a St. Bonaventure shot attempt. 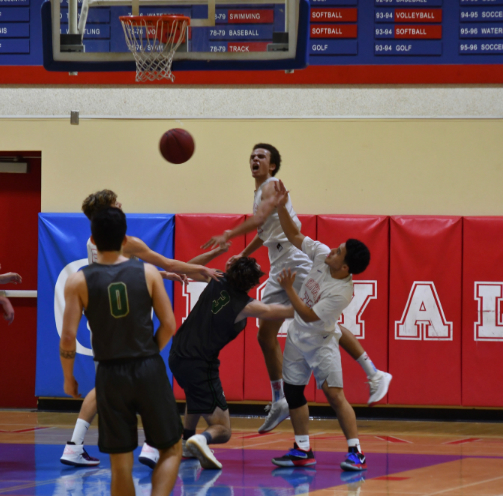 The San Marcos High boys basketball team survived a second-half surge by visiting St. Bonaventure to claim a 77-76 overtime victory on Saturday night at Maury Halleck Gymnasium. It was the final non-league contest for the Royals before they plunge back into Channel League play and St. Bonaventure proved to be a worthy adversary after overcoming a 38-23 halftime deficit to force overtime. Beau Allen led the way for San Marcos with a team-high 27 points. None more important than his two free throws with 16 seconds remaining in overtime that gave the Royals a 77-76 lead that they would not surrender. For the visiting Seraphs, senior guard Kai Rojas spearheaded the second half comeback with a game-high 30 points, including a clutch three-pointer under immense pressure that tied the score at 67-67 with four seconds remaining in the fourth quarter. Rojas was electric in the open court and after going scoreless in the first quarter he attacked the basket relentlessly to get St. Bonaventure back into the game. The Royals opened the game with an 8-0 run capped off by an Allen layup and took a 18-9 lead into the second quarter after an Isaiah Hicks pull-up jumper just before the first quarter buzzer. A youth movement was evident for San Marcos throughout the game as sophomores Max Sheldon, Isaiah Hicks, John Connolly and freshman Shakir Ahmad played key roles. Ahmad finished with 20 points, including a three-pointer that tied the game at 75-75 with 50 seconds remaining in overtime. Sheldon poured in 11 points, including three baskets from beyond the arc and Hicks chipped in eight points. San Marcos (8-6 overall, 2-0 Channel League) will continue Channel League play at home against Cabrillo of Lompoc on Tuesday.